Only when travelling. There I was packing up my belongings ready to leave Noosa when I hear my name from the doorway. Michelle,from the Whitsundays, is standing there staring into my room waving at me. What a coinkidink! We set of for a coffee where we sorted out her life and planned her holiday to Thailand to meet me before I, once again, had to jet off to catch my last Greyhound to Brisbane. A fairly painless journey (as it was only two and a half hours long) with 'The Holiday' to keep me company. An excellent Christmas film but far too romantic so I just blocked it out with 'Essential RnB' courtesy of my very battered iPod. Once at Brisbane station I managed to walk the wrong way for 20minutes before realising and then dragging my stupidly heavy bag the right way for 40minutes. I hadn't booked a hostel before arriving (living on the edge here!) but I knew there was one '285m from the station'. More like 285 miles! After bothering every OAP I came across I managed to find it (on top of a bloody hill) and handed over all my money and checked in without really paying attention to what the lady said; something about a sun terrace, movie room and quiz night. Sounded good but with only 24 hours in Brisbane I didn't spend any time at 'Chill Backpackers', I just grabbed a map and wandered off down the road. It took me a really long time to work out where the hell I was and what I wanted to see and do. Most of Brisbane shuts up at 5pm and as it was nearly 4pm I just settled for a long walk around the South Bank, The Arbour walk, The Botanical Gardens, Queen Street, City Hall the ANZAC Memorial and then back to the hostel to pack. I didn't get back until 8pm which meant that I managed a 4 hour walk with no food and no breaks. I just didn't realise as it was all quite beautiful. Lots of areas were destroyed by the floods along the South Bank, which was such a shame. The inland beach was drained and under reconstruction, the paths around the Botanical Gardens were worn away and a little perilous and the lower areas of the Museums were closed due to flood damage. However there was still so much to see and the Arbour walk in particular was lovely. The centre is quite busy but it doesn't take long to walk around it and there are still plenty of old Victorian buildings amongst the skyscrapers and a Starbucks. One thing I did notice was the amount of memorials and references to fallen soldiers around the town. I assume there must have been a high percentage of Brisbanites (no idea what their collective term is) who joined ANZAC and the war effort. 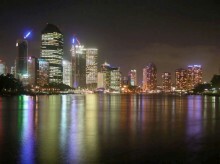 On a whole I was pleasantly surprised by it all and liked Brisbane a lot more than I expected. Not quite Melbourne though. Nothing quite beats Melbourne.